Last edited by VictoriaVWilson on Tue Nov 30, 2010 9:31 pm, edited 1 time in total. Greens and Purples and Polka Dots, oh my! 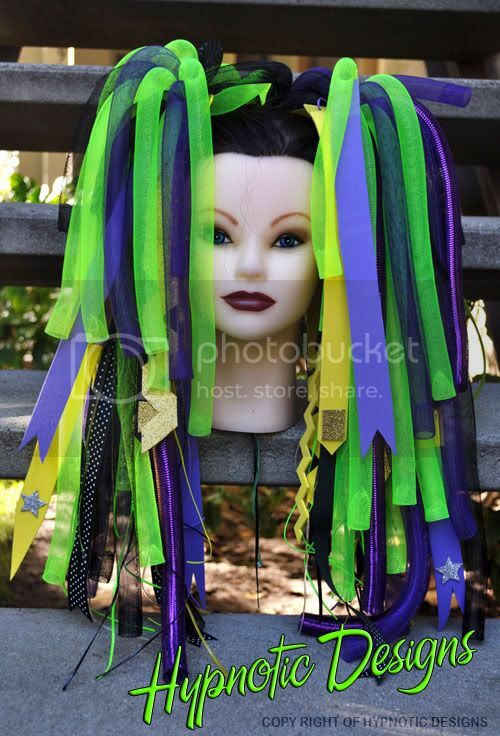 I'm just now warming up to cyberlox, and these are adorable. Great color and material pairings! If I were to actually critique, I'd recommend throwing some thinner material nearing the top, just so that the upper layer looks as varied and creative as the lower layers. But even if you didn't do that, it looks great! Last edited by mandikat on Tue Nov 30, 2010 4:11 pm, edited 1 time in total. Anyone else think they are a little bit too similar to CyberloxShops 'Mega Mutant' Cyberlox...................? I don't beleive she has copied, it is just a colour way- and you haven't used yellow at all. Lets face it the use of foam is not origninal, neither is cutting it into shapes or sticking things on it, use of ribbons is not original (she has used a ribbon, you used rubber matting). All cyberlox falls in a given colourway are going to look similar. Am I going to say I was copied? Of course not- all 3 sets are quite different as well sa being similar. It is a fact of hair making. Little Pink Faery, thank you for your comments. I have known of Miss Needles work for many years so am fully aware of the way her falls, the variations she produces and how they are made and even own some. They are beautiful works of art and she is a very talented lady. I might add that we have recently had a new customer come to us because she had bought some Miss Needles falls and had said that due to the amount of plastic and tubing etc in them, they were too heavy. In my personal opinion, which I am entitled too - the HD cyberlox are very similar to our very own design - Mega Mutant which are a very popular design and have been bought and worn by many of our valued customers. The cut of the foam and the similar colour scheme reminded me of them a lot. It is not a criticism at all. Of course I am aware that the use of foam is definitely not original. But what you can do with foam can be. This is what makes every set of Cyberlox different to another. Here the foam is zig zagged with V shapes at the bottom - coupled with the colour scheme used, it is undeniably similar. Your falls don't have foam in them, and also have wool so of course don't look similar in the slightest. I didn't say that HD had copied, but that they were similar. With regards to you comments on our Falls, I welcome relevant suggestions. However as I am sure you have seen, we have a huge range of Cyberlox in all manner of texture and media and lengths. All of our falls are well designed and constructed so that when worn, they look good and are comfortable. The foam is cut to the width which means that they fall well and retain volume which works well for us, and our valued customers. I have already made some Camo falls with spray paint on them, which are on the website. Due to such high demand for our current cyberlox, I have thus far been unable to add more to our site, but as soon as I get a free minute will be doing so. In short, I have merely made an observation here and hope that on a popular board such as this full of knowledgable ladies that my comments should be as appreciated as the next person. I have to say, I've been super inspired by Cypherlox's foam falls that they're starting to look a lot like hers (but made in a completely different way, so we're not completely similar). These are similar in colour ways too, but not the same falls by any means. By the way, where on earth can you get that rubber netting?!?!?! Cyberloxshop...um... think you misread that- the comments for improvement were for the OP not you! Why would they be for you when it is the original OP who is asking for advice? Sorry if you thought it was aimed at you to improve. "my comments should be as appreciated as the next person"
You didn't make any commnets about the falls in question- only suggested they were a little like yours in a manner that suggested you were not happy about this. the only comment you made was that they were 'a bit too similar' that to me suggests you only made comment to make an insinuation of copying- that is not constructive. Please do offer constructive comments for the OP to help her improve rather than point out similarities that are not really relevant. She has put her own falls in here for HELP and FEEDBACK, not to be told they are similar to yours which gives no constuctive commnet other than to point people to your falls instead. My orignial comment was to state how unecessary it was to put a huge picture of yours falls up- if you had shown yours and then gone on to say how they were an example of how improvements could be made then it would be a different story- but you didn't. I have seen it in DIY stores and some supermarkets and camping shops- it is non slip matting. hmmm.... I think you are on to a solid start here. Personally, I think there is too large a disparity in the layers. I would even them out more, or have them taper down to the longest length. Also, you have a lot of different accents going on. I would pick one or two types and stick with it, otherwise they can look a bit busy. These things are, of course, more personal preference rather than technical flaws. Not to add any fuel to the similar/non similar fire, but I really feel that I should say that a lot of bets are off when it comes to making and selling cyberlox. Crin only comes in so many colors and so many sizes. It is the same material wherever you get it. There are only so many color combination's that really WORK and will sell well. The fact that some sets MAY look similar in the end is just the nature of the beast when you deal with the material. I don't think copying and copyright issues with crin falls really hold up, unless of course actual photos of someone's work have been stolen. Yes I did think your comments were aimed at me I must admit! Looking back on it I should have added some critique along with my first comment, so please accept my apologies. I saw HD set and thought they had such similarities in some of the foam to my own Mega Mutant that I got a little key happy. Just to clarify, the ONLY reason I posted the same size photo of Mega Mutant was to show the similarities in the foam, in case others hadn't seen it before. No other reason. I felt your suggestion that I had posted a photo to gain notoriety was a little off hand. To suggest that would mean that Lara was doing the same for those reasons, which is simply not the case. If anything I am sure Victoria could get some hints from the photo on the foam layering. To add some critique to the HD falls for Victoria, gladly. It appears that you have attached the crin well, but are having a few issues with the foam. The main part which needs some work is the way you attach the foam. The joins are clearly visible through the crin, which is not something you want. Try to find a new way of attaching the foam so it is nearer to the top of the falls so it won't show through the crin. You may want to make a layering technique to do this. Rexlace isn't in my opinion the best way to attach foam to your mount ie. Elastic or ribbon, purely because it breaks so easily. It may be an idea to watch some videos on how to make foam falls, and then work up from there as seeing how other people make them is always of interest and can really improve your technique. Lara has some really good tutorials. As you can see from Laras, Chrissys and my own Cyberlox, we all have a layering system. This means that the foam is not all on show at the bottom of the Cyberlox, but in stages down each fall. 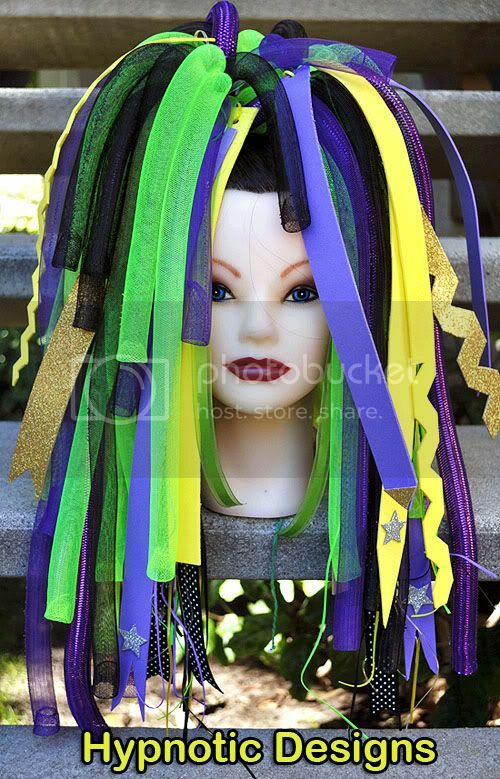 This adds volume and definition to the Cyberlox. Another fun thing to do is adding rivet holes and inserting rivets. This adds another texture to your foam. There are lots of effects you can do with foam, cutting, paint, hole punching. The list is endless. In the end, just maintain your own unique style and keep at it! I'm sure I'm not the only person who will look forward to seeing your next effort. I hope this will be of a help to you and look forward to seeing your next pair. One last thing....Why isn't Miss Needles on here? She is barely mentioned and her work is fantastic. and O man I am so sorry I was not trying to copy any ones Cyberlox. I was just using up the last of my crin and these colors are what I have left that looked any good together. THe Crin in these are neon yellow which looks like green errr... and ya i have had trouble with the foam I never can get it to be very close to the top. But today I am going to take a better picture of the falls. This picture was just very fast so I could show how they looked. Don't worry! 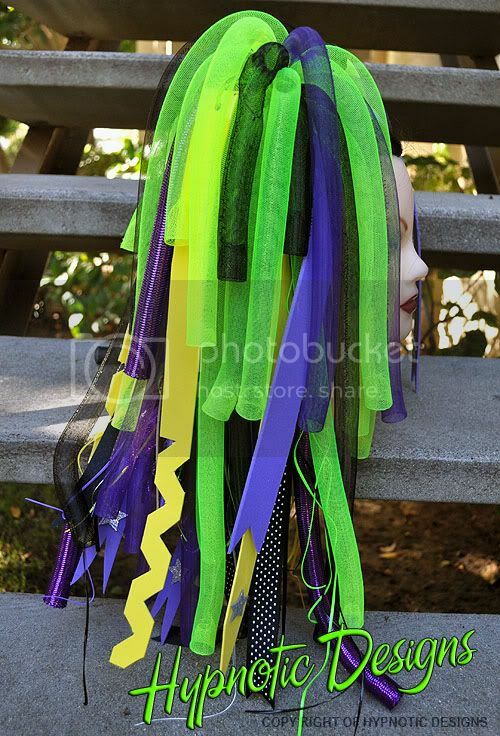 I didn't say that you were trying to copy anyone's Cyberlox. I simply noted how similar they were that's all. If you want any help with the foam, just ask! I still am very sorry. Y ai need lots of help with foam... How do I get the foam to lay right and not show? OK, well try putting the foam on first and working the crin around it. This way the foam will show on top all the way down, rather than not at the top and lots at the bottom. Try to attach the foam nice and tight at the top and cut it a little thinner then it will fall much better. Ok thank you very much for the help . Am I the only one that doesn't think Miss Needles' work is all that? I mean, it's good, but it doesn't really do anything for me. The plastic tubing just looks really, OTT. And the dreads look a bit, not up to scratch, especially the silky ones, ends not sealed. Okay, I know this is a little off topic, but Victoria, I adore your squishy face in your profile picture! Do you think it's possible to put a bit of the fun polka dot foam on the top falls? I'm just throwing out ideas. 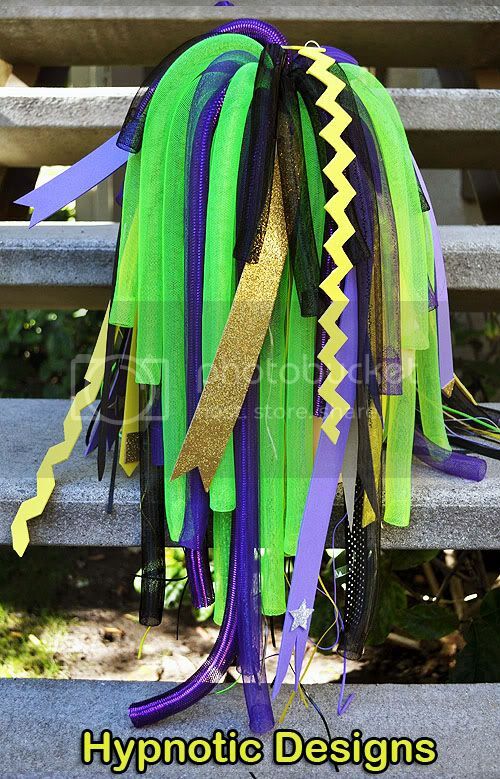 I really think these are great, and purple and green are so freaking rockin' together. Okay, and seriously, I'm done commenting on this thread now. Haha! But man never even though of doing polka-dot foam in them.. Ill rt that in my next set. It works if you keep all your foam punches when you punch holes! The gluing part is not fun though. Try cutting out biohazards... They are the worst!!!!!!!!!!!!! !